On the leeward slopes of Haleakalā, the Kula Forest Reserve (FR) was established by Governor’s Proclamation in 1912 with a purpose much different from most other forest reserves. It was established with the intent to reforest the area that had been converted to pasture after 20 years of livestock grazing. This 4,931.35 acres of public land is bordered primarily by privately owned land, but the mauka boundary of Kula FR is directly adjacent to the Papa‘anui Tract of the Kahikinui FR. 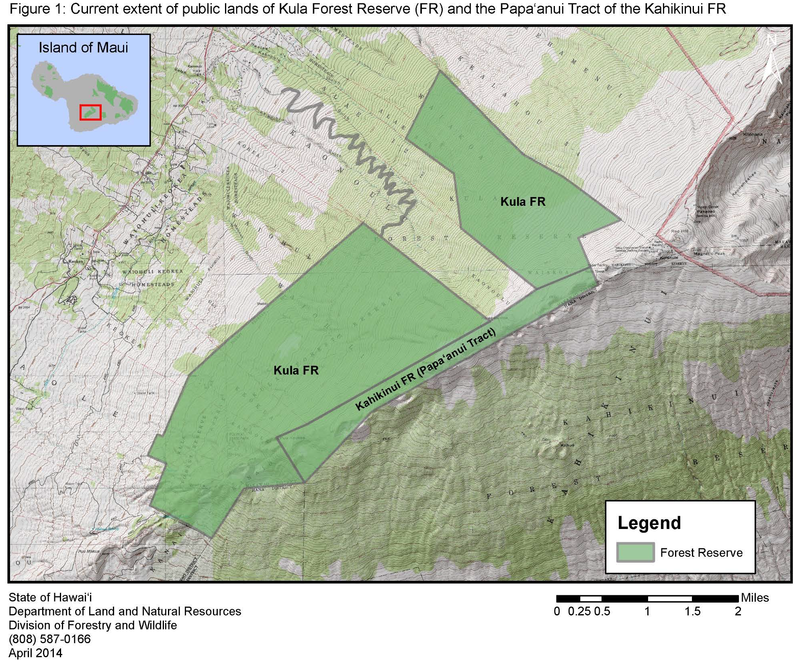 The Papa‘anui Tract was included with Kula FR in the management plan due to their adjacency to one another. The remaining majority of Kahikinui FR will be address in a separate plan at a later date. 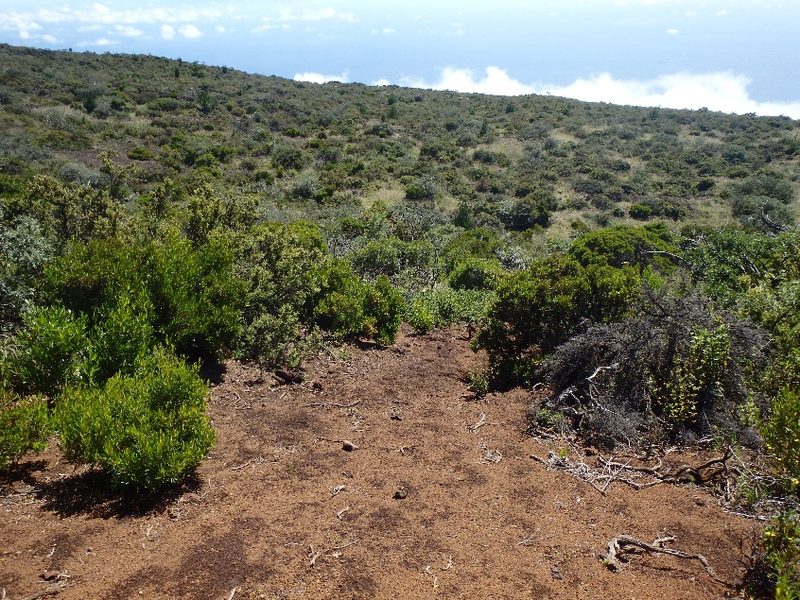 Papa‘anui consists of approximately 713.57 acres of public land located on the ridge top just above the Kula FR. The word “kula” is translated as plain or open country, and is also used as a term to describe dry arid lands. The moku (district) of Kula manifests this description and encompasses most of the central plains of Maui. Although the region was not believed to support much kalo production, ‘uala (sweet potato) thrived in this dry environment and was once considered the staple crop of this area. In the late 1880’s, crown and government lands in Kula were leased for pasture purposes. 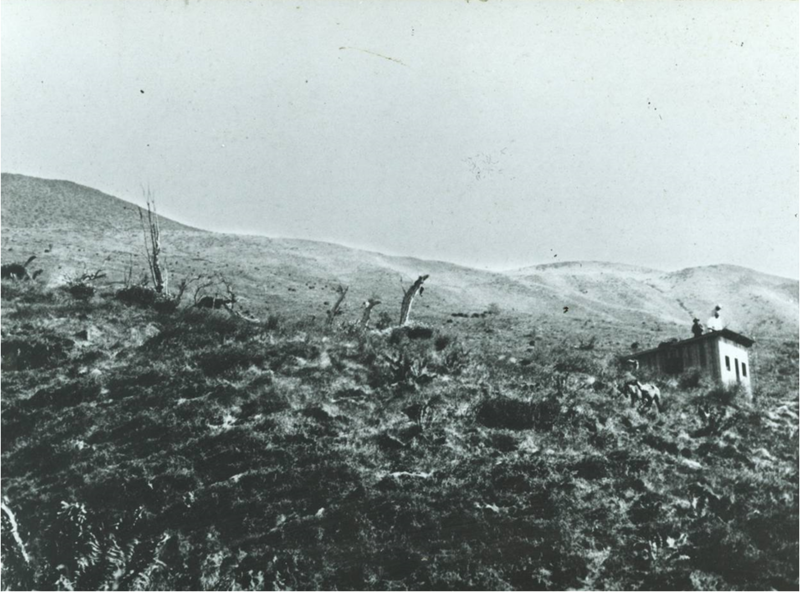 By 1912, the former extent of the forest was still evident by the “dead stubs, small groups of trees in certain steep-sided gulches where they are protected from cattle, and scattered groves of Mamane,” (Hosmer 1912). After decades of cattle ranching and grazing, the original forest cover, likely dominated by koa (Acacia koa), ʻōhi‘a (Metrosideros polymorpha), māmane (Sophora chrysophylla), ‘a‘ali‘i (Dodonaea viscosa) and pūkiawe (Leptecophylla tameiameiae) had been replaced by a dense ground cover of non-native grasses. An intensive planting program for Kula FR was initiated around 1924, and in the 1930’s the Civilian Conservation Corp (CCC) planted stands of tropical ash (Fraxinus uhdei), sugi (Cryptomeria japonica), redwood (Sequoia sempervirens), maritime pine (Pinus pinaster), Monterey pine (Pinus radiata) and Monterey cypress (Cupressus macrocarpa). 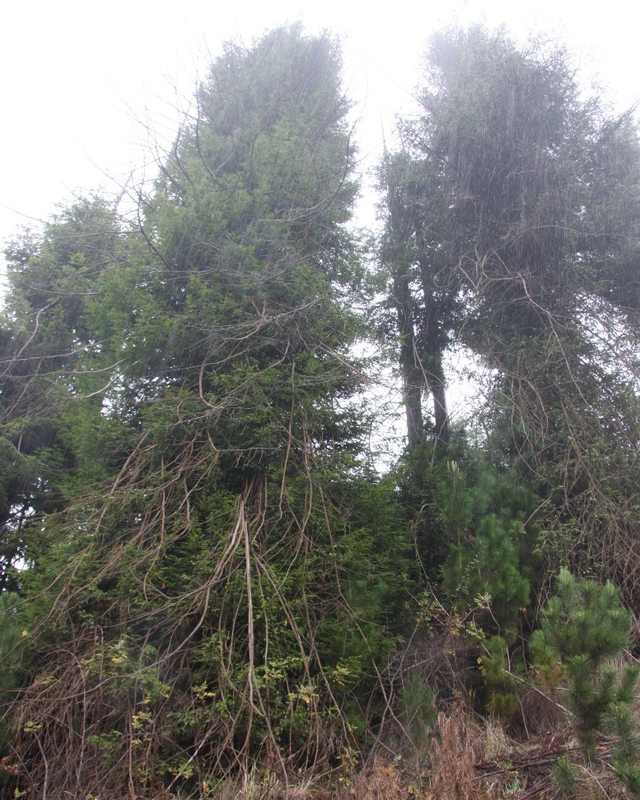 It was decided early on that introduced trees of high economic value would be used to create a forest resource that could potentially be harvested in the future. It was also hoped that increasing the forest cover in an area that was considered to have a scarcity of natural supplies of water would help to secure the fresh water resource provided by the springs that occurred in the district. 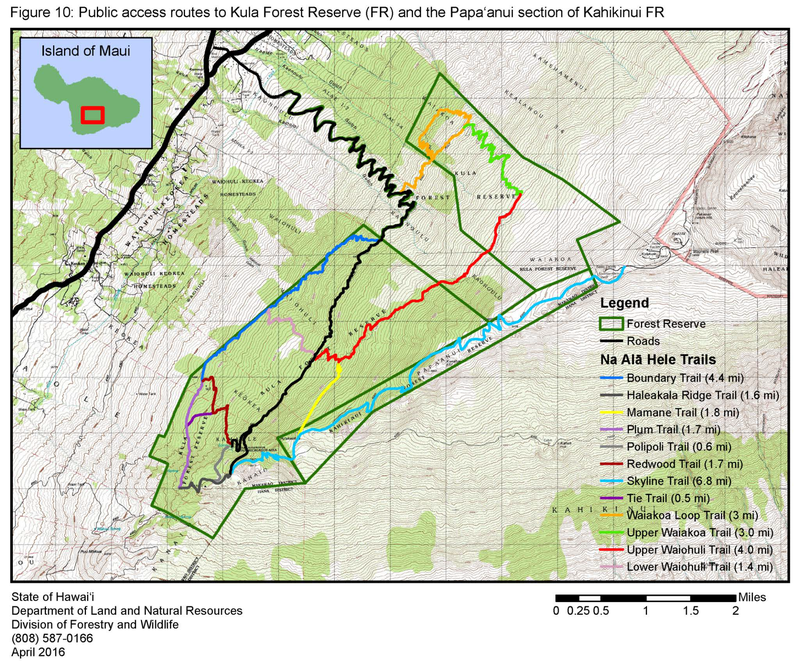 Public access is available to the majority of the Kula FR and Papa‘anui. Polipoli Access Road (also known as Waipoli Access Road) crosses through private land and provides legal public access through the majority of Kula FR, ending at Kanahau Gate (also known as Yellow Gate). Only street legal 4×4 vehicles are allowed past the FR entrance gate. 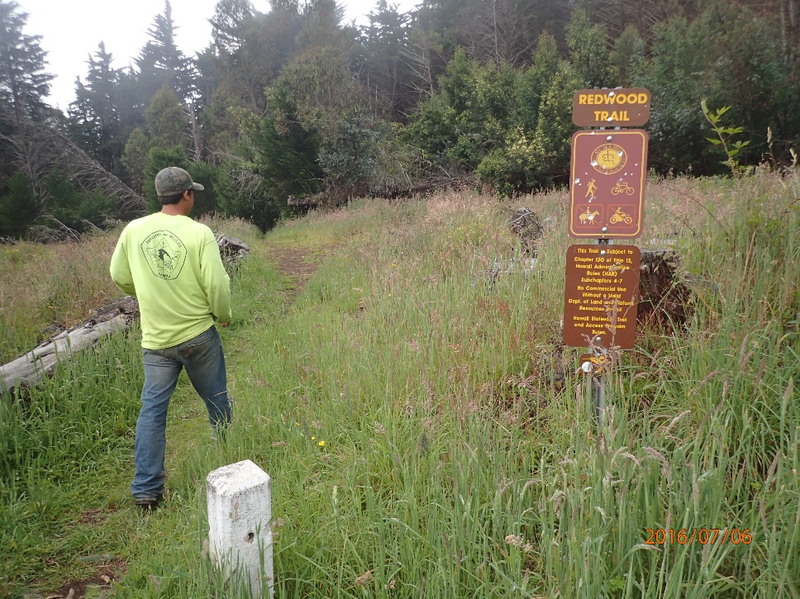 Nā Ala Hele, the State of Hawai‘i trail and access program (HawaiiTrails.org) has twelve interconnecting trails that provide additional public access in and around Kula FR and Papa‘anui: Boundary Trail, Redwood Trail, Plum Trail, Tie Trail, Haleakalā Ridge Trail, Skyline Trail, Waiakoa Loop Trail, Upper Waiohuli/Waiakoa Trail, Lower Waiohuli Trail, Māmane Trail, and Polipoli Trail. Additional information can be found at the Nā Ala Hele website.